Getting married? “That’s for crazy people!” I used to think. 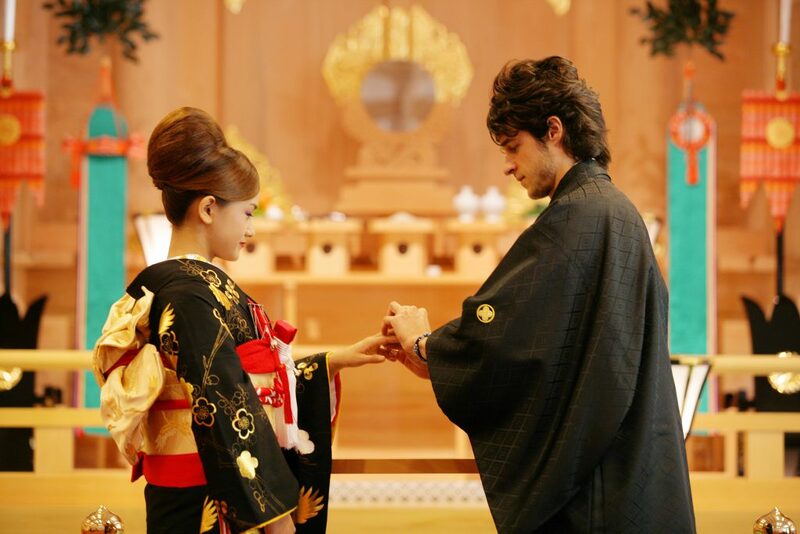 However, one day I found myself engaged to a Japanese woman, living in a country thousands of kilometers away from my home (Colombia, South America), immersed in such a strange but amazing culture! Living in a country like Japan, where very few people speak English, it’s enormously important to at least learn some basic phrases so you’re able to communicate with the people. In my case, I wanted to marry a Japanese girl, Yuki Sakamoto, so I really needed to learn the language! That’s why I purchased Rosetta Stone software, to be able to tell her father my intentions. Just two months into studying Japanese, I was already feeling very confident. So I asked her father, Kouichi San, for her hand, knowing that according to Japanese traditions you have to go through a hard (but funny) process! Yuki told me that I needed to go to an onsen (thermal waters) with her father, get in naked and rub his back with soap. It’s not that I am embarrassed; I have been to many nudist beaches in my life, and I’ve done some crazy naked stuff in my young days, but this time was different. I needed to spend some naked time with my father-in-law, and some other 20 Japanese males naked in a small onsen, to be able to marry his daughter… But it was worth it when he gave us his blessing! Kouichi san and I were very good friends. We used to talk a lot when I was starting to learn the language and each time I was getting better and better. One time, he and his wife, Midori San, told me that they wanted our wedding party to be different, to be more special. So two days before the wedding they brought me to a kimono rental place to find a Hakata (male kimono) for me and an amazing golden kimono for Yuki. Both were amazingly beautiful, it felt like I was in a Japanese fairy tale. On the day of the wedding, we woke up very early. I put on my samuray clothes and met with Kouichi san as I was travelling with him to the Kirishima temple, an amazing place surrounded by mountains in the south of Japan, Kyushu island. There was Yuki with her stunning kimono, and a big smile in her face, waiting for me. Some “Konnichiwas” and “Konbanwas” (I was feeling like I was in one of my Rosetta Stone classes! ), some smiles to her family, and the ceremony started! All her family was sitting on the left side of the wonderful shinto shrine, and on the right was the space for my family, who were thousands of miles away, not knowing this amazing adventure I was living. A wedding in my country can be fun and beautiful, but this was another world, it was like a Hollywood movie, and the main character was me! The ceremony started and I was able to understand what people were doing and saying, sometimes with a smile, sometimes with a more serious expression to reflect the moment. It was only at the end of the ceremony that I didn’t know what to do when people start clapping their hands. Should I kiss her? Or just hug her? Maybe they would appreciate that, would they think it was rude? Many thoughts came into my mind, knowing that Japanese culture can be so different at times, and that displays of affection are not often expressed in public… but, without thinking too much, I grabbed her hand, softly touched her face, said “minna san, arigatou” (“thanks everybody”), and gave her a BIG kiss on the mouth! I am a professional rock climber with 15 years of experience. Surfer and backpacker. I love and enjoy the nature. Yuki Sakamoto is a beautiful Japanese girl, who I brought from one of my trips, and with no doubt I married her. We currently live in Medellin, Colombia.